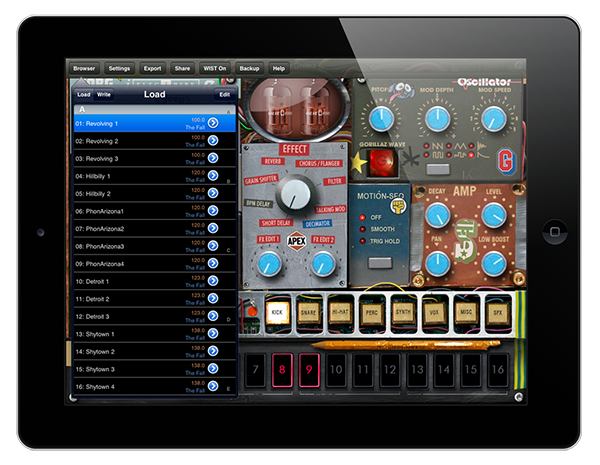 KORG iOS app updates now available! 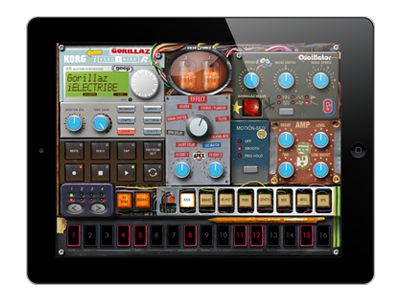 Up to 50% OFF all KORG iOS apps and KORG Legacy Collection series! The new KORG Module and the updated KORG Gadget are now both available! Special sale for two weeks! Remix Gorillaz on the iELECTRIBE! 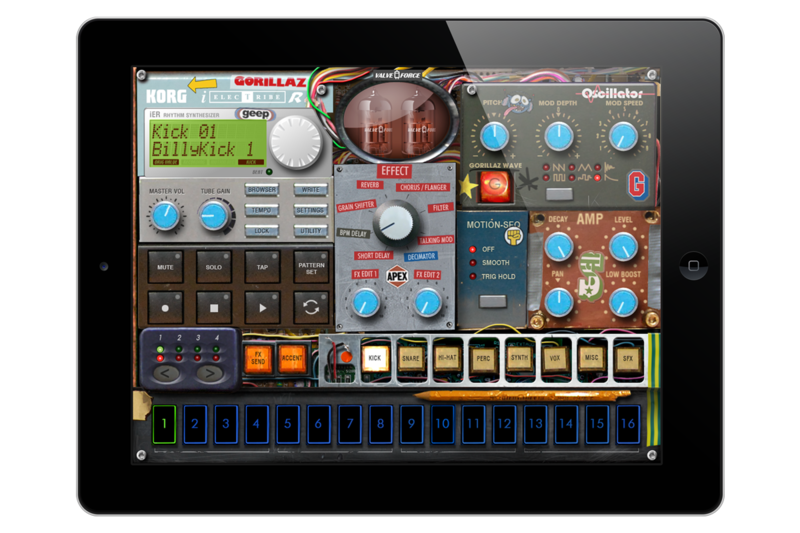 Korg has teamed up with the hugely popular virtual band Gorillaz to create a new dedicated beatbox for the iPad: The iELECTRIBE Gorillaz Edition. The world’s most successful virtual band, Gorillaz has just released their fourth album The Fall on vinyl, CD, and digital download. 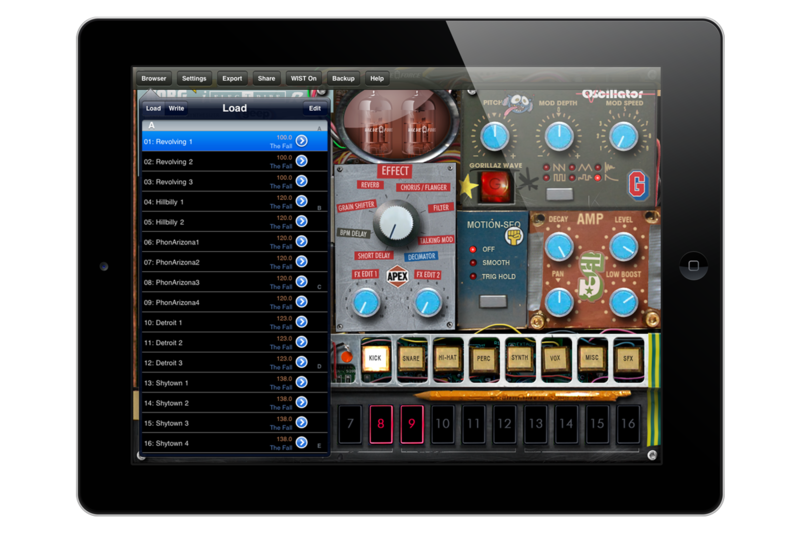 The Fall was produced on an iPad using the top-selling music app, iELECTRIBE. As a result, Korg and Gorillaz have now joined forces to create the new iELECTRIBE Gorillaz Edition! The world’s most successful virtual band, Gorillaz was formed in 1998 by bass-slaying mastermind Murdoc Niccals, vacant pretty-boy singer 2D, Japanese girl guitarist Noodle and hardman drummer Russel Hobbs. 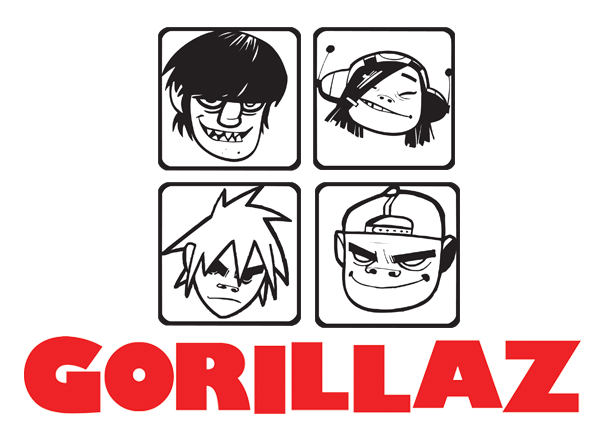 In March 2001, Gorillaz released their debut album Gorillaz to international acclaim and in 2005 Gorillaz cemented their reputation for musical and visual innovation with their Grammy nominated second album Demon Days. 2010 saw the release of the band’s third album Plastic Beach ahead of nominations at the 2011 Brit and Grammy awards. The band’s latest album The Fall was gifted to their fanclub on Christmas Day 2010 and released on vinyl for Record Store Day on April 16th, ahead of a CD/digital download release on April 18th. 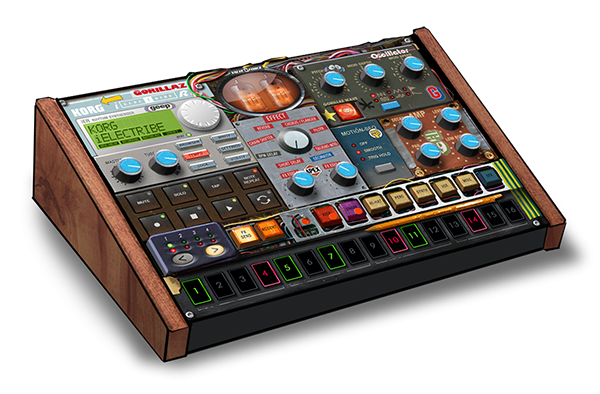 While retaining the intuitive beat-making features of the iElectribe, the special Gorillaz Edition is a new machine that&apos;s been customized to generate Gorillaz samples from The Fall which allow the user to create music in a wide variety of musical styles. Creative, fun, and up-to-date, this app will be enjoyed both by Gorillaz fans, as well as by modern musicians everywhere. The synthesizer engine features a carefully chosen selection of sounds that were actually used in the latest Gorillaz album, The Fall. There are eight parts, categorized by instrumental category. Each part provides 16 sounds, delivering a total of 128 sounds. The Gorillaz Wave function lets you use the 16 step buttons to switch sounds, intuitively manipulating the sounds as part of your musical performance. A total of 64 ready-to-use pre-programmed patterns are provided. 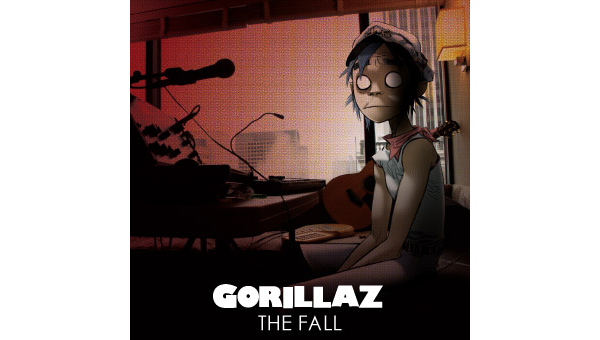 This includes 32 patterns recreated from the most recent Gorillaz album The Fall, plus 32 remix patterns created exclusively for the iElectribe Gorillaz Edition. The sound team behind all of the patterns includes Stephen Sedgwick, who co-produced the fourth album Gorillaz album The Fall, as well as Korg’s highly- regarded sound team. Limited Edition! A limited run of 10,000 of the KORG iElectribe Gorillaz Edition for iPad will be available for purchase as download from the Apple App Store (inside the iTunes Store) at a very special price of USD9.99 for units. Register for the KORG app News Letter so that you won&apos;t miss the latest news and information about KORG app. 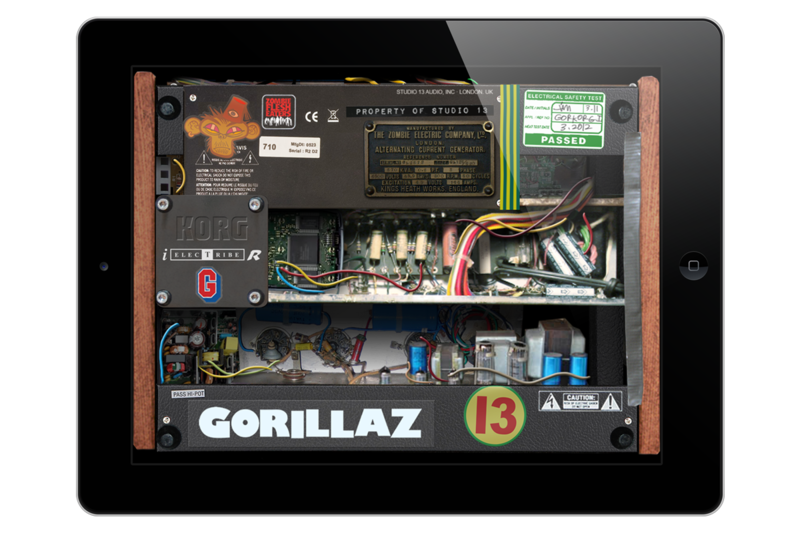 iELECTRIBE Gorillaz Edition is available for download purchase from the Apple App Store.